Six gifted Grade 12 scholars are one step closer to claiming their share of R800 000 to help realise their dream of studying the performing arts at tertiary level. This incredible opportunity has been granted to them as part of the 8th annual Arts & Culture Trust (ACT) Scholarship Programme. Since 2009, ACT has been supporting arts students through this Programme. The only difference this year is that there are more Scholarships on offer to Grade 12 scholars and first and second year university students than ever before. 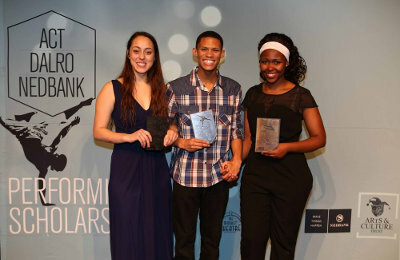 Funded by the National Lotteries Commission (NLC), and supported by the Dramatic, Artistic and Literary Organisation (DALRO) and the Nedbank Arts Affinity, the 2016 Scholarships Programme will change the lives of dramatic arts, singing, dance and musical theatre scholars and students with scholarships to the value of R800 000. After a nationwide search, ACT has selected six Grade 12s from across the country. They are; Sibusiso Nhlapo (20) from Alberton, Gauteng, National School of the Arts; Tamzin Williams (17) from Cape Town, Western Cape, The Settlers High School; Thandaza Silwane (18) from Lady Grey, Eastern Cape, Lady Grey Arts Academy; Jeani Heyns (18) from Cape Town, Western Cape, Bloemhof Girls High; Virtuous Kandemiiri (17) from Centurion, Gauteng, Lyttelton Manor High School; and Robin Castle (17) East London, Eastern Cape, Stirling High School. All exceptionally excited about making it through the audition process, this super six all firmly believe winning an ACT Scholarship would offer them a life-changing opportunity. She says that winning a Scholarship would mean the world to her. “It would help write a prominent chapter in my story,” she concludes. Virtuous Kandemiiri from Centurion says winning a Scholarship would not only allow her to do what she feels most natural doing, it would also help lift the financial burden of tertiary education fees off her family. “Performing arts is a huge part of my life, a natural sense of being home and doing what I believe I was born to do. This opportunity is everything that I need right now,” she says. Broad horizons are what all the finalists have their sights set on, but the Eastern Cape’s Robin Castle says he hopes the fact that he’s realising his dream will encourage others. The six Grade 12 scholars will showcase their talent at the final event on Monday, 10 October at the Market Theatre in Johannesburg. The winners will be named on the night. For more information, please visit www.act.org.za/programmes/scholarships.html.